In Tarot for April 2019, The Tower is the arcana that dictates what will happen this month and it indicates a violent and radical change that will lead us to rethink our life. The triad of tarot cards that strike the most fear into the majority of consultants are The Death, The Hanged Man and The Tower. 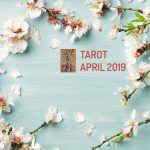 In the case of tarot for April 2019, The Tower shows us a sudden, radical change which usually causes a lot of fear usually for those who suffer its fate. Usually they are people who hate any kind of change to their daily life which turns them into accommodating beings, who do not want complications in their existence. However, they are not happy with their daily life, but the fear that a possible change from the known bad to the unknown good is greater than their desire to try for it. What should be clear is that in without risk there is no reward in life. A sudden change always produces respect, but it also means the beginning of something new, perhaps the opportunity that we have been waiting for for years. You just have to accept it and adapt to the new way of life. The image of the card, with a tower getting struck by lightning, is quite explicit. A lightning bolt finishes at the top part and, due to the impact, two people fall to the ground, along with the rest of the stones and debris coming from the explosion. It is true that the lightning can come from both outside and inside the tower. Something that would symbolize both a change from the outside that will make us change our life, and a change that has arisen from within us, generating an internal deflagration that will lead us to change the way we understood life. Sometimes it is even interpreted as a sexual exaltation, where the repressed character of a person ends up exploding and letting out all the energy contained by fear of what others will say. This card in tarot for April 2019 may indicate that we are going through a critical period that may blow up on us at any moment. Although situations like this produce fear and anguish, it also indicates that calm will come after the storm and a new and hopeful period will follow. This will be reflected at work, where it is possible that we lose a job that we have and like so much. Something similar will happen with health, where we could be the victims of accidents or break something in our body. Certainly it is not a time to spend or invest money. If this happens it will be in an unexpected, radical way, like for example if we win the lottery. On a sentimental level, breaking up with your partner is very likely, either through separation or divorce. Normally the cause of this situation will be the appearance of a new person that makes us fall in love with and drives us crazy.